Browse below to see projects and other creative happenings at Pine Grove School! 5th Grade goes to Ferry Beach Ecology camp each October and, thanks to the RPEF, they receive a disposable camera and an art assignment to take picture with that camera. Upon returning, Ms.Dubis prints the pictures and students do three projects thorughout the duration of this unit on shadow and value. 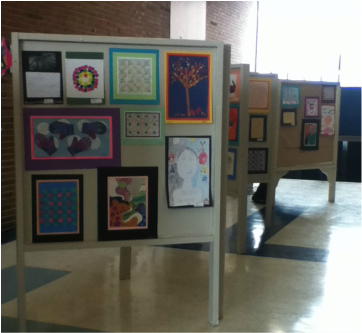 Here, the work is on display at the Rowley Public Library. 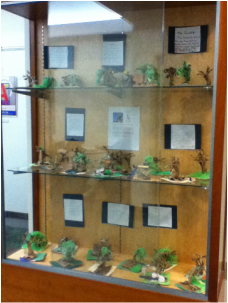 These trees were created by 4th grade students at Pine Grove School. We discussed shape and form as we looked at the oldest living tree for inspiration. Students also read Shel Silverstein's poem "The Giving Tree" and had a class discussion about memories and personalities of trees and nature. From these two sources, students used paper bags to form the trunk and branches before adding his/her own story to the trees. Each has such personality and, when combined into a display, form a forest of vitality and spirit. Each year Triton has a District Arts Festival with Visual and Performaing Arts being celebrated across all grade levels, K-12. Here is the setup of the K-6 display in the halls of Triton High School.